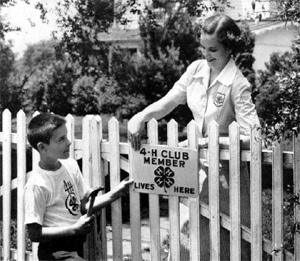 From a promotional standpoint, perhaps the most effective item the National 4-H Supply Service (4-H Mall) has ever offered is the small, rectangular sign which simply states “4-H Club Member Lives Here” – seen across America on fences and gates and posts by the driveway for decades… and still tremendously effective. It simply conveys that a 4-H kid lives in this house… and that is good; the home of a 4-H family. In addition to the “4-H Club Member Lives Here” driveway signs, welcoming signs were prevalent across America… and still commonly seen in rural areas today. These vary in wordage but always carry the 4-H emblem and a message. Upon entering a town or village the sign might read “4-H welcomes you to Crescent City” or if it is located at a county line it might say “Rock County 4-H Clubs Welcome You – Drive Safely” or something similar. This entry was posted in History and tagged 4-HHistory, 4-HPromotion by Larry Krug. Bookmark the permalink.